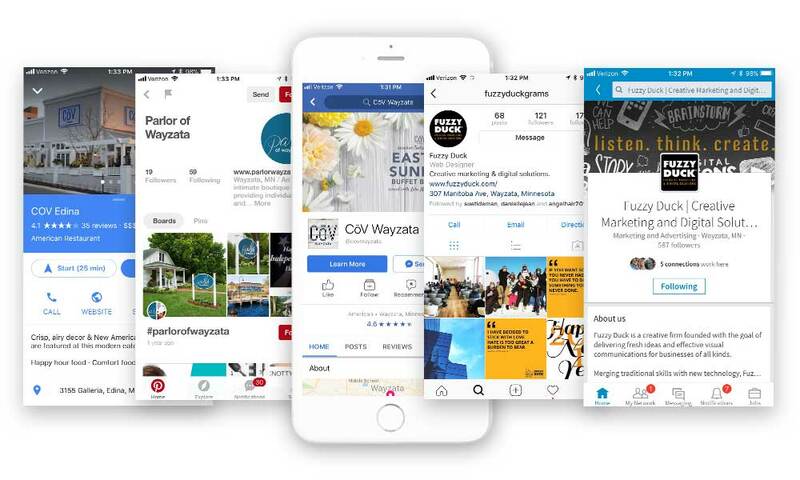 Our goal at Fuzzy Duck is to provide a comprehensive social media program that better aligns with our clients’ overall branding and achieves their marketing initiatives more effectively. Fuzzy Duck staff will work with you to create and grow a strong social media presence on channels such as Facebook, Twitter, LinkedIn, Instagram, Pinterest, YouTube, etc. What Social Media can do for you! Social Media is an excellent platform for achieving nearly any business goal. A combination of multiple social networking platforms will be a cost-effective strategy to expand your company’s customer base throughout all desired markets. Each channel has has its own unique advantage when it comes to reaching a specific audience. Facebook is the dominant social networking platform by total users, frequent users, a variety of demographics, and level of user engagements. Linkedin is an extremely effective platform to use for hiring, recruiting new talent, and reaching out to business professionals. Youtube is the ideal social networking platform for communication atmosphere and high-value experience customers through video. Twitter helps to connect with other Twitter users at the relevant time of your promotion products or events. Blogs are a great way to get unique content out in the world-wide-web to help increase your search engine optimization and organic traffic. Other social networks like Instagram and Pinterest are growing networks to drive new customers and share your style and branding throughout a wide range of customers. You’re soo stinkin’ good at what you do! Love it! Please post right away! Many thanks!!!! Interested in our Social Media Services?